Paramount have released a looooad of video footage related to Star Trek Beyond, all ready to be chopped up and used in media reports on the imminently released film. But of course thanks to the internets us die-hard types can just watch the whole lot! 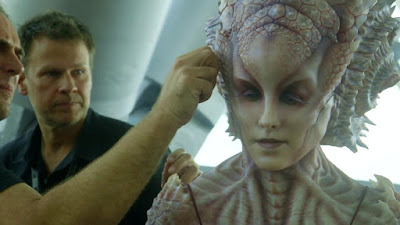 This first video is B-roll footage, giving us a variety of shots of sets, actors on and off camera, new alien make-up and more. 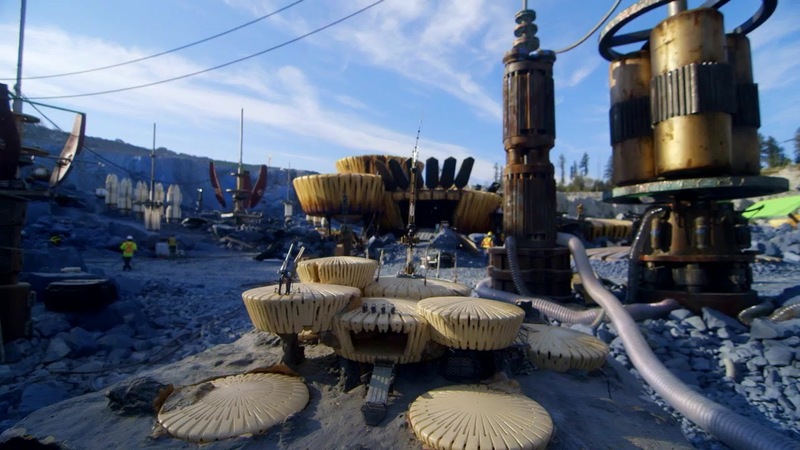 Another very impressive set is Krall's base, or whatever it is (I keep thinking of it as a mine), on Altamid, this shot seems to show the set, and a study model. What I like about this huge set is how much real stuff there is! Plus there's something about the colours and design which make it delightfully retro. Some more new aliens, we're meant to have fifty new designs for the fiftieth anniversary remember, so there's loads to spot! Interesting to see Jaylah out of her usual costume. And I'm sure not by accident there are quite a few shots that focus on the late Anton Yelchin. Paramount have also released loads of interviews. 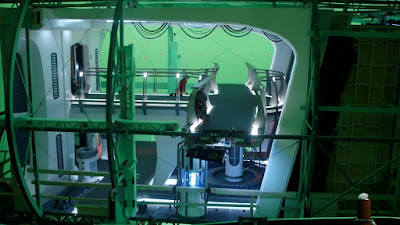 This first batch filmed on set during production, and there are a few recurring themes, in one way or another just above everyone discusses the cultural impact and longevity of Star Trek in light of the 50th anniversary, there are many tributes to the late Leonard Nimoy, a lot of discussion about having Justin Lin as the new director, Simon Pegg doubling as writer, and the greater emphasis on the ensemble cast in the new film. Director Justin Lin talks about how he got recruited to work on the film, his history as a fan, the time pressures of production, Star Trek as a tent pole movie, and those common discussion points noted above. 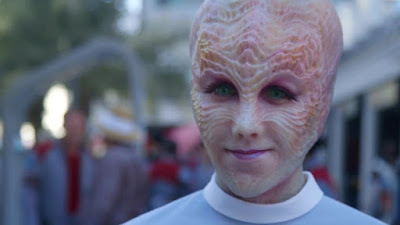 Producer J.J. Abrams discusses where the film sits in the overall Kelvin timeline story, who Krall is, lavishing praise on Sofia Boutella's Jaylah, Yorktown's representation of the Federation and Roddenberry ideal, the use of present day influences in the future setting, and more. 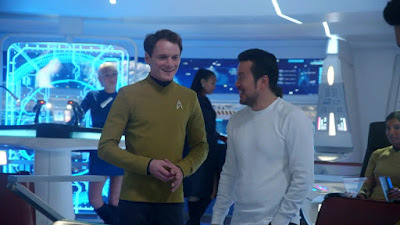 Writer Doug Jung is also listed as "Ben", which I presume is the name of his character, Sulu's partner. He talks about the opportunity to write the film, and his history as a Star Trek fan, the expectation of fan scrutiny, the effort to put in references, and the others bits everyone talks about. Writer and Scotty actor Simon Pegg talks about how he paired up the characters (once they've been split up after the Enterprise's destruction), Scotty's attitude, and more. Sofia Boutella, aka Jaylah, gives one of most insightful interviews, both in terms of in-universe details, and every aspect of creating her character. She talks about her first day, stuns and choreography, the relationship between Jaylah and Soctty, which she describes as "brother and sister", a brief bit about Jaylah's backstory, working with Justin Lin, her training and prep, the make-up process, and using the time in the make-up chair to meditate and get into character, her costume, integrating into the cast family, and Jaylah's use of holographic decoys. Idris Elba who plays Krall, talks about being recruited for the role, the development of Krall's character, which extended right into the filming, his costume, which he interestingly noted will have moving parts adding in post production, some thoughts on The Original Series and more. Chris Pine, who is of course Captain Kirk, sings the praises of the cast and how nice it is to work together again, talks about enjoying doing comedy moments, and liking the collaborative writing process of this film, the realities of Starfleet life that the film explores, and the usual points all the interviews cover. 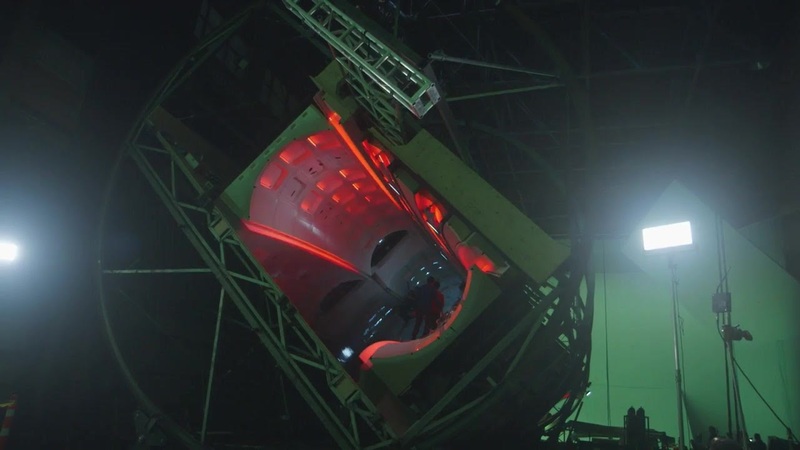 He also discusses Spock's story arc in the film, Spock and McCoy's relationship, Spock's humanity, working on those impressive sets seen above, and other points. 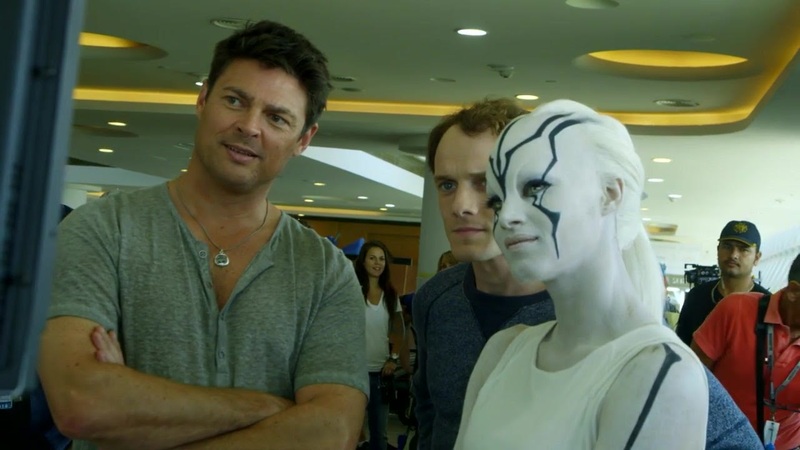 Karl Urban, our good Doctor McCoy, talks about the accessibility of Simon Pegg as a writer, the use of McCoy's relationships with Kirk and Spock in the film, and has a slightly odd could-be-advert for Dubai moment. Zoe Saldana covers all the common points covered by all the interviews, and in particular highlights working alongside John Cho. John Cho talks about his history working with Justin Lin, who had both worked together on projects early in their careers. He also discusses some of the themes in the film, splitting up the crew, and more. And if all that wasn't enough for you, a whole new round of interviews was filmed more recently at a press event. Many of the same points are discussed, but of course they've all had a few more months to consider the answers now! First up, director Justin Lin again, who among other things discusses the decision to destroy the Enterprise, and what that and other things allowed him to explore in the film. He also discusses the casting Jaylah, and how they crafted the role around the actress. J.J. Abrams talks through all the usual points being made in these interviews, with particular praise for Sofia Boutella and Idris Elba. Sofia Boutella draws a nice parallel between herself as an actor coming to the group and Jaylah, and how both were able to become part of the crew. 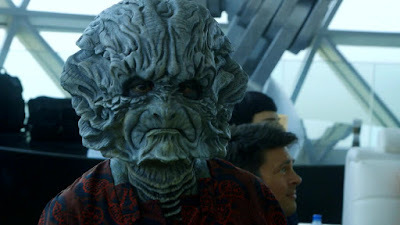 Idris Elba talks about Star Trek's part in his growing up, a bit about diversity, but mostly about Krall; what the character is as a counterpoint to the Federation,pinning that characterisation to present day culture and politics, and what it was like acting under the prosthetics. Chris Pine and Zachary Qunito are interviewed together. 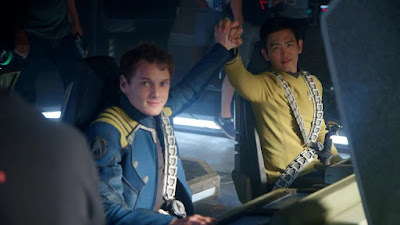 Among other things Qunito elaborates a bit more than the earlier interview on what drives Spock through the film, and Pine talks about the shift in Kirk's character. Karl Urban and Simon Pegg are also paired up, in one of the more thoughtful interviews of the batch. They both start off talking about how the writing of the film got going, including the collaborative spirit among the cast and writers throughout the production. Also revealed in the interview is the name of the Starfleet official on Starbase Yorktown, who is Commodore Paris (an ancestor of the famous family I wonder?). 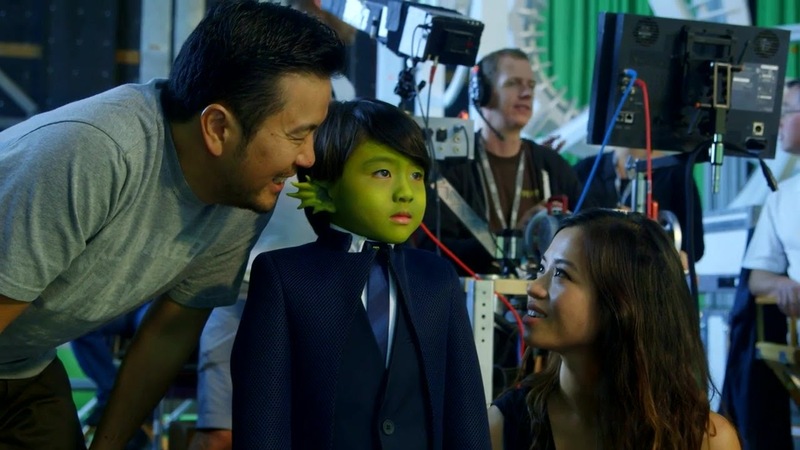 And finally John Cho and Zoe Saldana are one more pair, who discuss there characters, and the changes in the production compared to the previous films. Star Trek Beyond will be arriving in cinemas around the world from the end of next week. To keep track of all the latest information on the film, visit my Star Trek Beyond guide page, and see the relevant pages on Trek Collective Archives to find all the trailers, clips, posters, promotional stills, and featurettes. It looks like all these interviews together will be longer than the film itself! Chris Pine and Idris Elba will be on the Tonight Show with Jimmy Fallon this week.